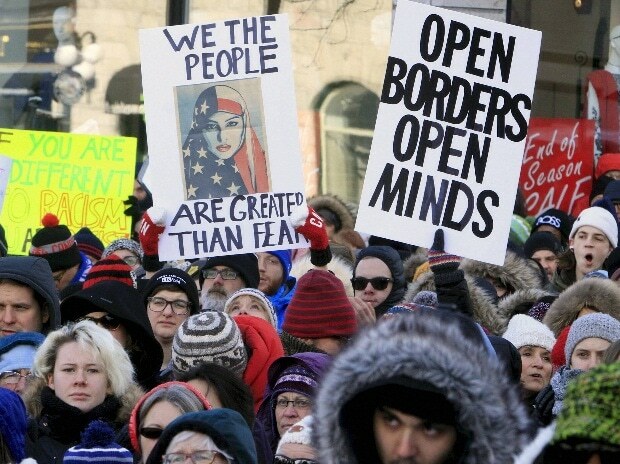 Thousands of people protest against the US immigration policy of President Donald Trump at the United States embassy in Ottawa. A California Islamic school wanted to keep an open mind before Donald Trump took office. But less than a month into Trump's presidency, the school rejected $800,000 in federal funds aimed at combatting violent extremism. The decision made late Friday night by the Bayan Claremont graduate school's board to turn down the money an amount that would cover more than half its yearly budget capped weeks of sleepless nights and debate. Many there felt Trump's rhetoric singling out Islamic extremism and his travel ban affecting predominantly Muslim countries had gone too far. It also marked the fourth organisation nationwide under the Trump administration to reject the money for a program created under President Barack Obama known as countering violent extremism, or CVE, which officials say aims to thwart extremist groups' abilities to recruit would-be terrorists. Bayan Claremont had received the second-largest grant, among the first 31 federal grants for CVE awarded to organisations, schools and municipalities in the dwindling days of the Obama administration. The school had hoped to use the money to help create a new generation of Muslim community leaders, with $250,000 earmarked for more than a dozen local nonprofits doing social justice work. But the fledgeling school's founding president, Jihad Turk, said officials ultimately felt accepting the money would do more harm than good. It's "a heck of a lot of money, (but) our mission and our vision is to serve the community and to bring our community to a position of excellence," Turk said. "And if we're compromised, even if only by perception in terms of our standing in the community, we ultimately can't achieve that goal," he said, adding that accepting the funds would be short-sighted. The school's internal debate is also emblematic of handwringing among grassroots and nonprofit organisations involved in the program in the last couple weeks. At Unity Productions Foundation of Potomac Falls, Virginia, officials said they would decline a grant of $396,585 to produce educational films challenging narratives supporting extremist ideologies and violent extremism "due to the changes brought by the new administration," according to a private message to donors reviewed by The Associated Press. And in Dearborn, Michigan, Leaders Advancing and Helping Communities said last week it was turning down $500,000 for youth development and public health programs because of the "current political climate." Ka Joog, a leading Somali nonprofit organization in Minneapolis, also turned down $500,000 for its youth programs.